Continuing armed conflicts between joint force of TNLA and SSPP/SSA troops and RCSS/SSA troops this week forced hundreds of villagers flee from their homes in Namtu township. 143 villagers from Mung Yin village, 58 villagers from Nawng Hkum village, 44 villagers from Nam Tek village, 143 villagers from San Je village, 43 villagers from Man Ti village, and 26 villagers from Kan Sa village have so far arrived in Shwe Min Ta monastery in Namtu town. 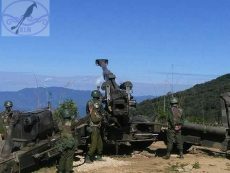 A combined force of TNLA and SSPP/SSA troops have fought against RCSS/SSA troops near Nam Te village on October 24 and 25. A couple who were traveling on motorcycle on the road between Man Kang village and Pang Lung village reportedly stepped on a landmine and seriously injured. No group has claimed responsibility for the landmine.